Hostel Accommodation Builder Nigeria - Hostel Design And Construction Company. Build Student Hostels Fast. Rent Fast. Hostel accommodation for students have always been in short supply in Nigeria Universities, polytechnics, and other higher institutions. Simple reason . . . most higher institutions in Nigeria enroll students in tens of thousands. And many of these higher institutions do not have ready hostel accommodation for the massive student population they attract from all over Nigeria to their schools. Even the Universities, polytechnics and other higher institutions in Nigeria who have student hostel within their premises do not have enough rooms to cater for the accommodation needs of as much as 50 percent of their student population. Therefore, the majority of students seek youth hostels or student accommodation outside of the school environment. Thousands of students are in constant need of hostel accommodation year in year out in higher institutions all over Nigeria. Therefore building student hostels provides a huge opportunity for you to earn good returns on your investment. Yes, get your money to work for you by investing in student hostels (or youth hostels). Building hostel accommodation has the same challenges as building any residential accommodation. How do you overcome these challenges and get a slice of the huge potential profits associated with building student or youth hostels? The solution is simple . . . just build a prefab student hostel. You're probably wondering, "why build a prefab hostel?" The reason is because a prefabricated hostel accommodation has unique advantages over a regular block building. In fact, building a prefab hostel building solves many of the challenges listed above. For example, consider the case of unpredictable construction cost. We are a prefab hostel construction company with expertise in building prefab houses all over Nigeria. When you approach us to build you a prefab student hostel, we issue you a quotation that shows you the total cost of the project. You pay nothing more. This means that when you use our prefab hostel construction service, you don't have to worry about cost variation. You pay the agreed cost and your prefab hostel building will be ready as and when due. Using a prefab construction company like ours also solves problems 2 & 3. That is, our engineers provide 100 percent supervision of the project on your behalf while you go about your normal everyday business. In addition, you don't have to worry about theft of your building materials because your payment covers the entire project and we take care of stock control to ensure the project is delivered on time and in full. 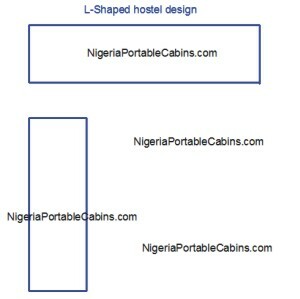 Prefab Hostel Design - Different Designs, Different Cost. So, what kind of student hostel design should you build? You build the design that matches your target and your budget. The low budget student accommodation market consist of students with low student allowance and therefore are searching for cheap accommodation. The medium budget market don't want something cheap. They are willing to pay a bit more to get some privacy. The premium market are children of big boys who want to live big like salary earners. The buck of the money to be made from the student hostel business is locked in the low budget and medium budget market. Reason: The majority of student accommodation seekers fall into this category. And collect high rent from small spaces. In simple words . . . you can earn as much as 20 - 30 percent more from the same property size if it's built as a student hostel. Which is cheaper to build? 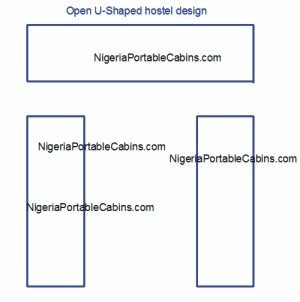 Of course, the closed U-shaped hostels cost less to build and allow the hostel accommodation owner to cram more rooms into the same land size. Want to build a student or youth hostel and profit from this huge market? Want it built super fast so you can start collecting rent within 2 - 4 weeks from today? Simply order our prefab hostel construction service by filling the form below. We will send you a quote for the prefab hostel design requested.